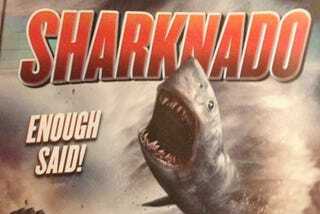 Filed to: SHARKNADO!Filed to: SHARKNADO! Seriously, guys. this is the best/worst movie I've seen all year. I need more. If any Z-movie needed a video game, this is the one. I want to be that dude who jumps into the shark's mouth and cuts his way out with a chainsaw. Nintendo&apos;s Super Smash Bros. Fighter Ballot is up!